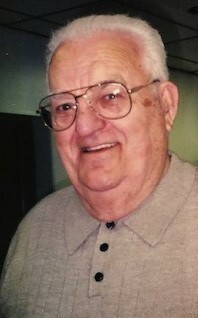 George C. Deluca, 93, of Thurmont, MD, passed away on April 13, 2019. He is survived by his wife of 72 years to Helen Deluca. In addition to his wife, he is survived by his daughter, Carol Council and husband Tommy of Morehead City, NC; daughter, Nancy Hamlett and husband Lewis of Damascus, MD; granddaughter, Angela Cotie and husband Chad, great grandsons Joey and Kenny Cotie of Missouri City, Texas; grandson Andrew Hamlett and wife Laurie; great grandson Aiden and great granddaughter Rowan Hamlett of Spotsylvania, VA.
George was preceded in death by his parents, Quinto and Phoebe Deluca, two brothers, Joseph and Ralph; three sisters, Palmira, Edith and Matilda and their spouses. He was the last of his immediate family. He was loved and admired by his many nieces and nephews and god children. George enjoyed sports and was an avid fan of the Redskins and the Yankees. He enjoyed traveling, volunteering at his church, playing cards and other activities at the Thurmont Senior Center. He especially enjoyed sharing the time with his family. He dearly loved his family. He was a WWII veteran and served with the 82nd airborne glider infantry in the European theater. He was a life member of the VFW, Post 2562, the American Legion post 168 and the AMVETS post MD 6007. His family would like to thank all of those who cared for him at St. Joseph’s Ministries, those who visited and shared their time with him, those who always remembered to share their get well wishes. Heartfelt thanks to wonderful friends and neighbors who offered their love and support. The family will receive friends from 6-8pm on Tuesday, April 16, 2019 at Stauffer Funeral Home, 104 E. Main Street, Thurmont, MD. The family will also receive friends from 11am-12 noon on Wednesday, April 17, 2019 at Our Lady of Mount Carmel Catholic Church, 103 North Main Street, Thurmont, MD. A Mass of Christian Burial will begin at Noon. In lieu of flowers, contributions may be made to Our Lady of Mt. Caramel Church, 103 Main Street, Thurmont 21788 or the Thurmont Senior Center, 806 E. Main Street, Thurmont 21788.